Discovery Friday with Rick Yancey! This is another one of those posts where I do a shameless plug for my workplace, but it also means good news for anyone in the area, because we have author Rick Yancey coming back to the Gainesville Barnes and Noble! If you live anywhere near a Barnes and Noble, you might want to drop in this coming Friday, November 22nd. BN is kicking off the holiday season with Discovery Friday, a full day of activities, giveaways, contests, storytimes, and author events. You can even enter to win a $1000 shopping spree! You can check out the full array here, which will give you the listings for stores in your area. 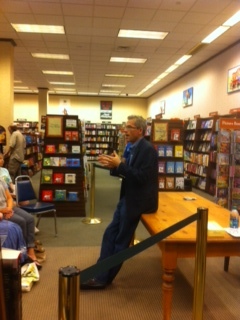 Our location is thrilled to have Rick Yancey back with us for a talk and signing for The 5th Wave. We’ll also have the Monstrumologist and Alfred Kropp series books available. The talk will start at 7pm, followed by the signing. If you can’t make it out? Well, we’ll miss you! But that doesn’t mean you have to miss out. Call the store any time between now and 645 pm on Friday, and you can order a personalized book over the phone, and we’ll get it shipped out to you. You can probably make it happen during the event itself, but be careful: you don’t want to call too late. We’ll have signed stock after the event, so you can still get signed (but not personalized) copies afterwards (HINT HINT: they make excellent gifts through the many approaching holidays). 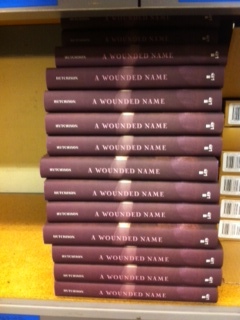 I don’t know that I’ll ever get over the sight of my own book coming in the back door at work. It is AWESOME. And now you can come share my excitement! This is just a reminder that I’ll be doing a signing at the Gainesville Barnes and Noble this Saturday, Saturday 28th, from 3 to 5 pm. There isn’t a reading but I will be delighted to answer questions, and of course there will be signing and smiles and swag (and apparently alliteration). If you have questions, you can ask them here, over on twitter (@dothutchison), on my facebook page (located on the sidebar), or you can also call the store at 352-372-3535. If you don’t live in the Gainesville area, or you just can’t make it in, you can still a get signed copy after the fact! We’ll be keeping a stash of books in stock, so you can call the number above and order a signed a/o personalized copy to be shipped out to you. I even keep a stash of purple Sharpies at work just for that purpose. I really hope to see y’all there, and I would love you forever and ever if you’d help me spread the word! It’s here! It’s real and out there and holy wow! And now, something I’ve been waiting for since I was about five years old, I get to announce my first signing in a bookstore! On Saturday, 28 September, from 3-5 pm at the Gainesville, FL Barnes & Noble, I’ll be doing my first signing. If you’re in the area, you’re welcome to come down! It’s not a solid two-hour event, we purposefully created a window of time to accommodate busy schedules (and football). For Gator fans, don’t worry- it’s an away game that day. If you can’t get down there, well, we’ll miss you, but it doesn’t mean you can’t get signed books. If you call the store at 352-372-3535, you can actually purchase copies over the phone and get them sent out. If you want them just signed, we can do that, if you want them personalized, I can do that too, all you have to do is let the cashier know so they can write it out on the slip for me. If you have any questions, you can ask here, or you can also call the store to ask. In the meantime, thank you all so much for all the good wishes and congratulations this past week. It’s been amazing and surreal and even though I’ve always wanted to get my books published, I think there was a part of me that was always convinced I’d never make it. Every now and then I have to go pet the cover to remind myself that it’s happened. It looks so pretty on the shelf! The title pretty much says it all. BEA was absolutely amazing! 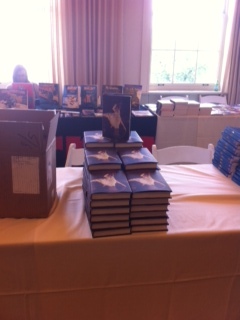 Before BEA, though, I actually did a signing at the School Library Journal Day of Dialogue. I got to see finished copies of my book for the first time! How crazy is that? And they looked so pretty all stacked up waiting for the panel downstairs to finish. 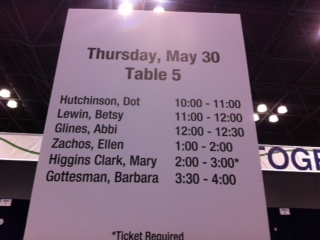 Here’s where my poor little debut author brain explodes: the other authors at the signing. I was sitting in the middle of a string of Caldecott winners. Jim Arnosky, Kevin Henkes, Chris Raschka, and David Wiesner. I grew up on Henkes and Wiesner, I do their books for storytimes at the store, and I was sitting right in the row with them! I was sitting next to Ayun Halliday, of Peanut fame. Linda Urban, of Crooked Kind of Perfect was there, and I just about died when I saw Elizabeth Wein, of Code Name Verity, down at the end of the line. Elizabeth Wein! Whose book absolutely blew my mind last year! I’ll be honest, there’s something terrifying about sitting in a row of names you know and adore, because it is super hard to feel legitimate. But everyone was wonderful and supportive, and I loved hearing the librarians talk about how many of the books they were taking home would be part of prizes for summer readers. Anytime people are reading, are being actively encouraged to read, it makes me happy. And then the next morning, BEA. This was my first year at BEA, and while I vaguely had the idea of a madhouse in my mind, I didn’t really have a clear picture of the scope. HOLY. CRAP. Walking into the Javits Center, seeing this miniature CITY of publishing booths, was mind-blowing. I literally had to stop and catch my breath. It’s one thing to know there are a ton of publishers and imprints out there, and another thing entirely to see them all spread out before you. It’s seriously a little metropolis of booths and pavilions, and there are SO MANY BOOKS. I’m not even talking about the giveaways, although there are certainly a ton of those, but just the books on display, the posters of some of the big books they’ve done or the big authors in their stables. As an exhibitor, I got to go in a little bit early, so I could kind of wander around while the floor was still empty, but then the doors opened and the crowds poured in and WOW. SO. MANY. PEOPLE. I mean, seriously, there was hardly room to walk half the time. Although, to be fair, part of that was people, part of that was the multiple, massive duffel bags full of books on people’s shoulders. I honestly can’t even imagine carrying that much around all day. One of the first things I got to see was at the Lerner Publishing booth, the parent company of Carolrhoda Lab. At this point, I’m so used to people spelling my name incorrectly that I’m just grateful it’s spelled correctly on the book. The signing was at ten, so a little before I went to the green room and got to meet Diana Peterfreund! I LOVED For Darkness Shows the Stars, and her upcoming release, Across A Star-Swept Sea is a post-apocalyptic, gender-swapped Scarlet Pimpernel. *Jaw drops* *drools* Seriously, there is nothing about this book I’m not looking forward to. And she dressed the part! The Pimpernel had a perhaps more-than-healthy interest in fashion, so Diana accessorized accordingly with a giant bow complete with a schooner replica. Honestly. An entire boat. I really, really wish I’d gotten a picture. But she was delightful, and suddenly I was a lot less nervous about my signing. And it went really well. Thank you to all of you who came by! Everyone was super friendly, and I had a blast. And I got to meet my fabulous agent! This is the first chance we’ve had to meet in person, and she’s as amazing in person as she is on the phone. I am seriously lucky to have her as my agent. She’s a straight-talker who encourages me to go with the crazy ideas and champions my work, without coating everything in a rosy glow. It took three years for me to find an agent, but looking back, it was totally worth the wait, because I found my perfect fit. I got to meet up with my friend Shelver, of Shelvers Anonymous, and we trolled around the floor for a bit, and as many incredible ARCs as were available, I’m rather proud of my self-control. 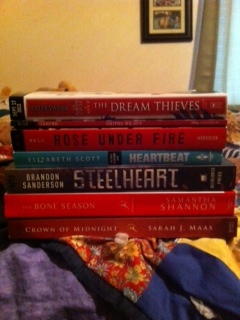 I went with a very specific idea of which books I was desperately wanting, and met with mostly success. The one I completely missed out on was Kendare Blake’s Antigoddess, which, you know, sadness, because I loved Anna Dressed in Blood, so the idea of that writing and lingering creep factor mixed with Greek mythology? WANT. But, I’ll just have to be patient for that one. Two others I didn’t get to get my hands on- but may have successfully made arrangements for- were Across a Star-Swept Sea, mentioned above, and Victoria Schwab’s Vicious. And speaking of Victoria Schwab, total author crush. She’s wonderful! I mean, I knew she was wonderful already, because I talk to her online, and she’s always supportive and super gracious and just awesome. But meeting her in person was amazing, because 1) HUGS! and 2) Vicious trading cards! And I think that’s really the best thing about BEA. It’s not the ARCs, it’s not the promotional information, it’s getting to meet people. While standing in line for Sarah J Maas’ Crown of Midnight, Shelver and I just kind of randomly bumped into Sarah Beth Durst; her book Vessel was amazing. I’d see a blogger’s name on the registration tag and there’d be that spark of “Oh! They talked about my cover!” or “Oh! They featured my book on a Waiting on Wednesday!” Putting faces to names and being able to make those real connections is just astonishing. I was only at BEA for Thursday, and I really, REALLY wish I could have stayed for the whole thing, but maybe next year, right? 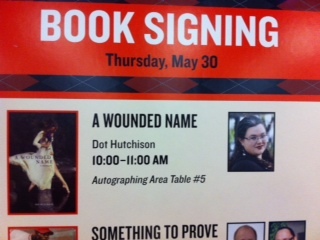 It was such an incredible experience, and I’m awed by the number of people who came by the signing to support me and A Wounded Name. Sincerely, and from the bottom of my heart: THANK YOU. Signed Copies of The 5th Wave! Last week, our store sponsored a signing with Rick Yancey, author of The 5th Wave, The Alfred Kropp series, and the Monstrumologist series, and oh, guys, it was awesome. If you ever have a chance to hear that man speak, DON’T MISS IT. He’s personable and incredibly smart and laid back, and a fifty minute talk felt like fifteen. Plus, the man is an autographing BEAST. We had a WALL of The 5th Wave that had to have at least three hundred copies, and he signed the WHOLE WALL. Well, if you missed the event and don’t think your path is going to cross with his while he’s on tour, it means we have a TON of signed copies, and you can get one (or more)! Just call the Gainesville Barnes & Noble at 352.372.3535 and we can process an order over the phone for one of the autographed copies and get it shipped out to you. And if you get a chance to meet him on tour, like I said, don’t let it slip by. He makes the first four waves sound terrifying plausible. Rick Yancey and The 5th Wave- signing! So, those of you who’ve been with me for a while (thank you for that, by the way!) know that I work in a bookstore. I’ve never actually named which one, largely for disclaimer purposes, but the cat was going to be coming out of the bag pretty soon anyway. Now, a quick note about that disclaimer: this blog, and in fact my entire social media presence, IS NOT affiliated with Barnes & Noble in any way- this is a separate thing, an extension of my personal life and my professional life only insofar as it pertains to my writing/publishing, and is not meant to represent or speak for the company IN ANY WAY. 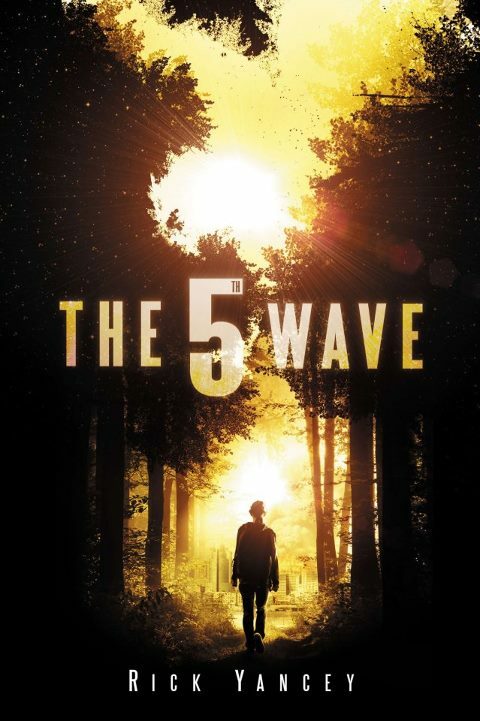 That being said, holy frickin’ crap, RICK YANCEY is coming to the Gainesville, FL Barnes & Noble to sign The 5th Wave! In addition to The 5th Wave, which is one of the spring’s most talked about YA books, Mr. Yancey is also the author of the Monstrumologist series and the Alfred Kropp adventures. The 5th Wave releases THIS Tuesday, 7 May, and Mr. Yancey will be at the Gainesville Barnes & Noble on THURSDAY, 9 May, starting at 7pm. We will have TONS of copies of the book, so if you live in or near the Florida Gainesville (because seriously, there are a lot of Gainesvilles in the south), stop in, get your copy, and get it signed! If you have questions about the event, the store’s number is 352.372.3535, and I REALLY hope to see some of you there! First things first, let’s announce the winners of the FIRST giveaway for A Wounded Name! The ARC and swag pack goes to…. In other exciting news, I’ll be at BEA! BEA, Book Expo America, is this amazing thing where they herd tons of authors together under one roof for ARC giveaways, signings, panels, and more. Pretty much, if you love books? BEA is a dream come true. And it’s where I’ll be doing my very first signing! Thursday, May 30th, from 10-11 am, I’ll be at Table #5 in the Author Autograph Area, signing advanced copies that you can then get for free! Honestly, I’m not even sure I can wrap my brain around the prospect yet. There are a lot of steps in the publishing process, and each one seems to be feel more surreal than the last. It’s hard to believe that in four and a half months, my book is going to be out! And soon–so very, very soon–people will actually be able to start reading the pre-release copies. So if you’re going to BEA, make sure to swing by Table 5 Thursday morning, say hello, and pick up a signed copy!